Misshapen, cracked, or stained teeth can put a damper on your self-confidence and become the only thing you think about when you smile. As a way to make your smile function and look better, Michael Moawad, DMD, and the dental specialists at Dental Arts of Edgewater offer porcelain veneers. 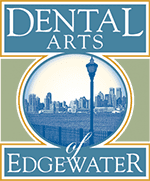 Located in Edgewater, New Jersey, the experienced team at Dental Arts of Edgewater can help you look and feel your best with custom veneers. Schedule online or call for an appointment. Veneers help re-create the appearance of your natural teeth with a thin layer of porcelain. Before bonding the veneers to your existing teeth, Dr. Moawad at Dental Arts of Edgewater goes tooth-by-tooth to fit each veneer. Veneers fix flaws like stains, cracks, holes, or misshapen teeth. They likewise help fortify weak teeth. Although veneers can be made out of resin composite materials, porcelain is the most stain-resistant material. Porcelain also tends to match your natural enamel better. Dr. Moawad thoroughly explains your options and recommends the best type of veneers for your specific needs. The process begins with a consultation to discuss your goals and determine the best type of veneers for your needs, after which you return for a follow-up appointment. Then, Dr. Moawad shapes your existing teeth to prepare them for the veneers by removing a tiny amount of enamel from the surface. Once your teeth are prepped, he takes a mold of your teeth and sends it to the lab, where technicians will make your custom veneers. When the veneers arrive from the lab, you return to the office and have them custom-fitted to each of your teeth. After cleaning and etching the surface of your teeth to prepare them for the bonding process, Dr. Moawad applies a special cement and light source that causes the adhesive to bond securely to the porcelain. In no time your veneers are permanently in place, and you have a new and improved smile! If you want to learn more about the convenience of custom veneers to improve your smile, call Dental Arts of Edgewater or schedule a consultation using the online booking tool.